The Palapa-A satellites, built by Boeing SatelliteSystems, are identical to the Anik A and Westar satellites Boeing built for the first domestic systems in Canada and the United States. The Palapa-A satellite program began in February 1975 when the Indonesian government awarded two separate contracts to Boeing for the construction of two satellites, a master control station for the entire system, and nine earth stations. Completion of the earth stations and development, construction, and launch of the first satellite took place in 17 months, one of the fastest production schedules ever undertaken by Boeing management and engineers. Other firms built 30 earth stations to complete the group segment of the system, which was controlled and operated by PERUMTEL, the government-owned telecommunications company. Palapa-A's specially designed antenna concentrated the satellites signal power on all Indonesian islands, including the main isles of Sumatra, Java, Bali, Kalimantan, Sulawesi, and Irian Jaya, as well as the surrounding southeast Asia area including Singapore, Malaysia, Thailand, and the Philippines. Palapa-A was a 12-transponder satellite with an average capacity of 6000 voice circuits or 12 simultaneous color television channels or any combination of the two. Contract lifetime of the satellite in orbit was seven years. 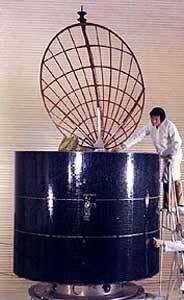 The satellite was 11 feet 2 inches high (including antenna) and 6 feet 3 inches in diameter. The shaped-beam antenna was a solar transparent 5-foot parabolic dish. Launch weight of the satellite was 1,265 pounds; in-orbit weight was 654 pounds. NASA's launch vehicle for the Palapa-A satellite was the Delta-2914, the same type booster used to launch the earlier Anik A and Westar satellites. Palapa, a name signifying national unity, was chosen by President Suharto in July 1975.